The four Manticore Studio Albums are presented in replica sleeve wallets and includes a poster! 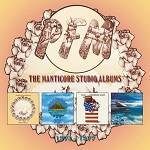 More information: A 4 CD Box Set, The Manticore Studio Albums 1973-1977 contains PFM’s classic releases Photos Of Ghosts (1973), The World Became The World (1974), Chocolate Kings (1975) and Jet Lag (1977). The four albums are presented in replica sleeve wallets and the set also includes a poster.